Whether at the control desk, in suspended operator panels or in the control cabinet, RMQ-Titan is number one when it comes to control circuit devices for machine and panel building. As well as the attractive and ergonomic design, the flexibility and versatility of the range always make it the ideal solution. All button plates, indicator lights and legend plates can be provided with abrasion resistant laser inscriptions of texts and symbols as required. Apart from the acoustic indicator, all RMQ-Titan front elements come with protection to at least IP67, thus already providing virtually unlimited scope for applications. 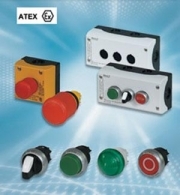 Pushbutton actuators and indicator lights even offers protection to IP 69K! They can therefore be cleaned safely with high-pressure and steam cleaners – a key benefit in applications where cleanliness and hygiene are important requirements. Mushroom actuators with a large actuation area offer more safety thanks to their conspicuous design and their ability to even be actuated with gloved hands. 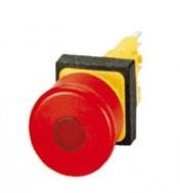 Illuminated Emergency-Stop buttons and buzzers ensure reliable signal indication even in dark rooms. 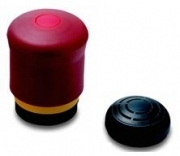 Special diaphragms are also available for protecting buttons against dust, flour or cement. Ready-to-use complete units are available for standard solutions such as ON, ON/OFF, Emergency-Stop with and without a keyswitch etc. They can be supplied for front mounting and in surface mounting enclosures. The foot and palm switch FAK offers special features. Created for particularly rugged applications with extremely high protection to IP 69 K, this device stands out with its impressive design, and is often seen in TV quiz shows. Moeller now offers the following in conformity with the manufacturers guidelines: ATEX guideline 94/9 EC (mandatory from 06/2003) devices from the RMQ Tiatn range and the FAK range. The switches are approved for device group II, with area of application "all except mining" as well as for category 3. The approval has the test number BVS 06 ATEX E023U, BVS 06 ATEX E024X. 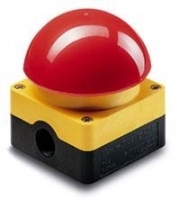 The Emergency-Stop button in the RMQ 16 range offers a number of significant features - tamper-proof, degree of protection IP 65, and the availability of an illuminated version. An integral multiple LED is either permanently lit or lights up when actuated according to the circuit design.